Just a few blocks away from Capitol Hill Books is the Denver Art Museum with its fantastic selection of art. The museum is particularly renowned for its Western and Native American art collections. We here at Capitol Hill Books are also big art fans and love having the museum and the rest of Denver’s vibrant art scene so close by. 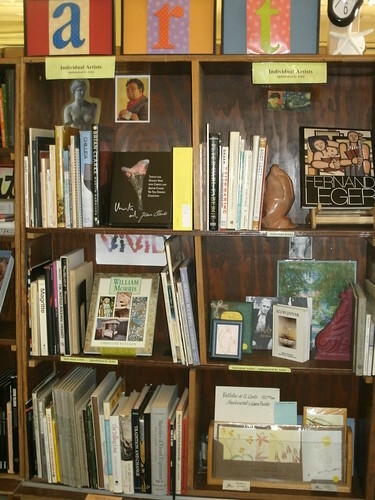 Fortunately for art lovers, Capitol Hill Books has recently received a large collection of art-related books including many books about Native American art and crafts. Our books include instructional guides, art histories, criticism, biographies and even books that have their own art prints that you can cut out and display in your own home. 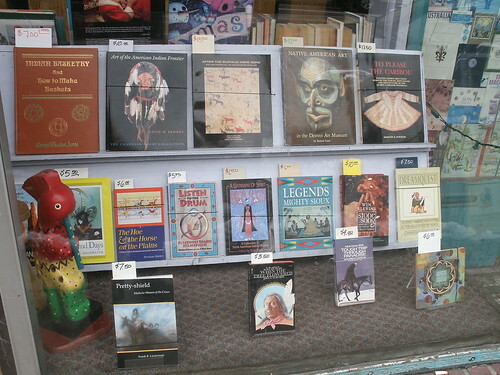 We have so many books that we’ve even put together a few window displays of our recent largesse. And the best part is that we are constantly adding new art books to our shelves. That way, our customers can keep returning and finding something new during every visit to the store. The next time you visit the Denver Art Museum or the other Downtown art institutions, be sure to stop by Capitol Hill Books and satisfy your art inspirations with our large collection of low-cost art books. This entry was posted in Uncategorized and tagged Art books, Capitol Hill Books, Denver Art Museum, Downtown Denver, Native American Art. Bookmark the permalink. ← A rainbow of book choices.